No artifice of “regulatory relief” or concern for untipped workers can justify this theft. In most states, tipped workers are paid a subminimum “tipped wage.” In Iowa the tipped wage is $4.35/hr. 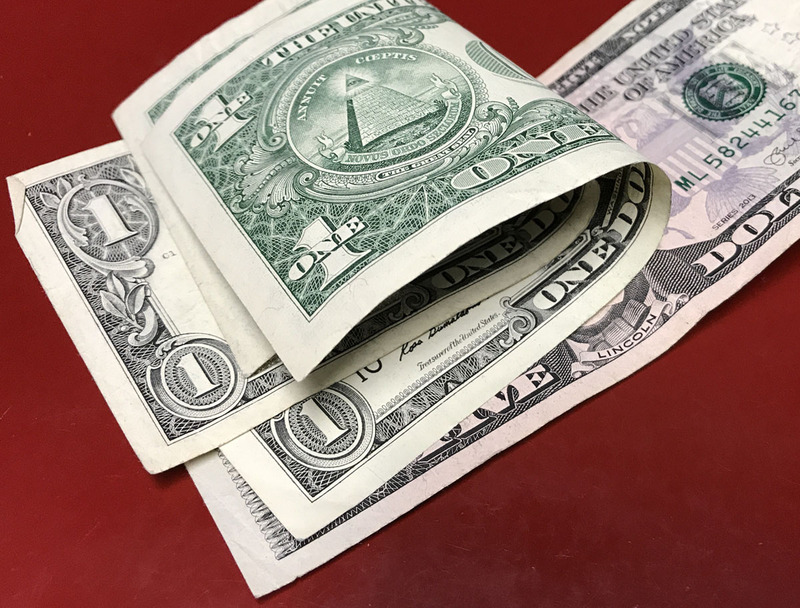 The gap between the tipped wage and the minimum wage (in Iowa, $7.25-$4.35 or $2.90) is called the “tip credit.” Tips are first used to satisfy this credit (bringing the hourly wage to the minimum); once the credit is satisfied, tips are an uneven addition. In December of last year, the Trump Administration announced its attention to repeal this rule (after already announcing its intention to cease enforcement of the rule last July). Under the new regime, employers of tipped workers could retain any tips in excess of those needed to satisfy the tip credit. 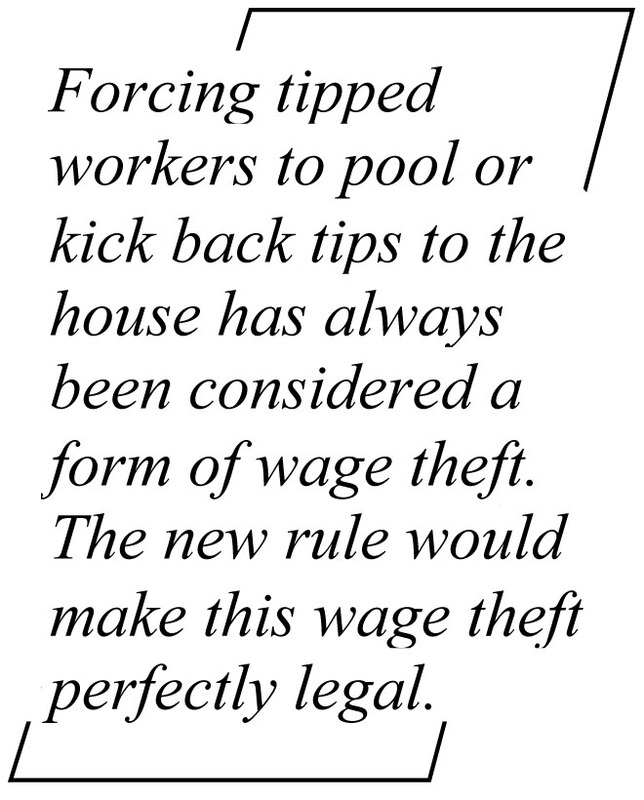 Forcing tipped workers to pool or kick back tips to the house has always been considered a form of wage theft. The new rule would make this wage theft perfectly legal. The new rule, the brainchild of the National Restaurant Association, rests on the thin logic that employers would share tips with “back of the house” staff. But nothing in the rule requires them to do so, and research on wage theft in various jurisdictions suggests that tip stealing by management is already widespread. Indeed, the DOL punctured its own logic with an internal study finding that the rule would result in huge losses to tipped staff, and then — in defiance of any semblance of good government and transparency — buried the study. Fortunately, the Economic Policy Institute (whose crack research staff includes the DOL’s former chief economist) has stepped in with its own look at the dismal impact of this rule. Using a combination of W-2 (tax) and industry data, EPI estimates a base of about $36.4 billion annually in tips (a conservative estimate, since a substantial share of tips go unreported as income). Since some of that $36 billion must be used to satisfy the tip credit, the share of that “at risk” is a little lower, about $26 billion. Grade school economics, in turn, would suggest that almost all of that $26 billion would be pocketed by employers: There is no need or incentive, after all, to share tip revenues with bussers and dishwashers, whose wages (and willingness to work) are already established by local labor markets. Fortunately, many state labor laws offer further protection or regulations of tipped wages that would not be affected or pre-empted by the new federal rule. This brings the take of this heist down to just under $6 billion. In Iowa alone (where no state laws supplement federal rules and standards on tipped work), the annual loss would be about $110 million. Looking at this on a smaller scale drives home the avarice and the injustice. Consider Francesca, a waitress at a mid-price, full service restaurant. Her base wage is $4.35. On a typical four-hour dinner shift, she serves eight tables. The average bill for those tables is $25.00, and the average tip is 15 percent or $3.75 — making her take home pay $47.40 ($17.40 in base wages and $30 in tips), or just under $12/hour. Under the new rule, Francesca would keep only enough of that $30 in tips to bring her wage — the base wage plus the tip credit — to the federal and Iowa minimum wage of $7.25. She takes home $29. If we follow EPI’s assumption, about half of the remaining tips would go to other employees, and about half would go in the employer’s pocket. Next Next post: Why do solar credits matter?